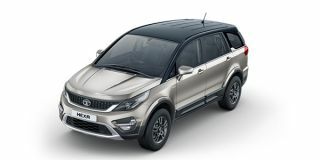 Tata Hexa launched : More value than Mahindra XUV500 and Toyota Innova Crysta? Share your experiences with Hexa? The Tata Hexa comes with a “don’t mess with me” vibe. From the front, its mean bonnet, the hexagonal front grille and projector headlamps create one helluva road presence. From the side, it is less imposing with its Aria inspired squareness, although it does stand tall with its 19-inch wheels. These are now available in a new diamond cut patt ern for Automatic variants while manual variants receive a new charcoal grey design. The drop down elements from the roof and the blacked-out pillar gives it a distinct look which is enhanced with new dual-tone option in the Infinity Black and Titanium Grey top end XT variants. The first thing you will notice from the back are the chunky taillamps that wrap around onto the tailgate. And yes, there’s enough chrome to impress potential Indian buyers. Staying true to its name, the Hexa can quite comfortably fit half a dozen people. The seats are quite comfortable and there’s enough space to film a Star Wars movie. Tall passengers won’t be complaining about the headroom or legroom either. Surprisingly, the third row isn’t as cramped as it seems. It is (almost) comfortable for any full-grown adult. The centre console now features a new 7-inch touch screen over the 5-inch infotainment from before, paired to the same 10 speaker JBL setup. If Tata paid a little more attention in terms of quality, the Hexa’s cabin would be one lovely space to be in. Speaking of which, you get 129 litres of bootspace, which is enough for a picnic basket. However, if you flip the third row, you can almost fit an entire dining table.